My collagraph prints, collages made from collagraphs, combinations of collagraphs and etchings, cut paper collages and mixed media acrylic paintings all deal with the nature of abstraction. My work, whether in printmaking or painting, is about exploring relationships. Bits and pieces from my visual experiences bump against each other. There are references in my work to the textures, colors, lines and shapes of things in the real world. The layering or unfolding of shapes, punctuations or expanses of color or character of a line order the picture plane. The resulting abstract images allude to natural forms. My collagraph and/or monoltype prints frequently become the basis for collage. The prints are background or foreground and provide texture and color which play off against other kinds of found paper to make the collage. Each step, expected, or unexpected, is the impetus to continue the exploration or the journey in this painting or print or the next one. All of the emotions are there: anxiety, elation, thrills, disappointment, you name it. Serendipity is the hallmark of my work. I love the unpredictability of working with paint, paper, ink and plate. Cecelia grew up in New York City and received a B.A. from Hunter College. She has lived and worked in Dallas, Texas since 1969. In 1976 she received a Master of Fine Arts degree from the University of North Texas. Cecelia has shown her work in many juried and solo exhibits. Her artwork is in private and corporate collections including Frito-Lay, I.B.M. and Delta Airlines. 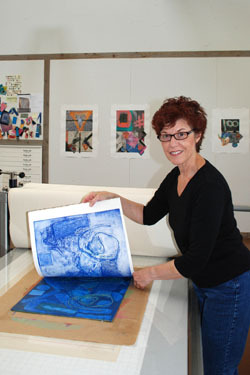 Ms. Feld is the recipient of a MacDowell Colony Visual Artist Fellowship, Peterborough, New Hampshire and a Residency/Fellowship in printmaking at the Vermont Studio Center, Johnson, Vermont.